Instant Pot Pastas are my new MOST FAVORITE THING IN THE WHOLE WORLD. Because my other favorite thing in the whole wide world is the Multi-Cooker. I’m beginning to think I have a small kitchen appliance problem. But it’s really a “I just need these adorable devices to take care of dinner for me” problem. And they both do an amazing job at that. And they keep me out of the drive thru and calling for takeout. This is just after opening up the lid. 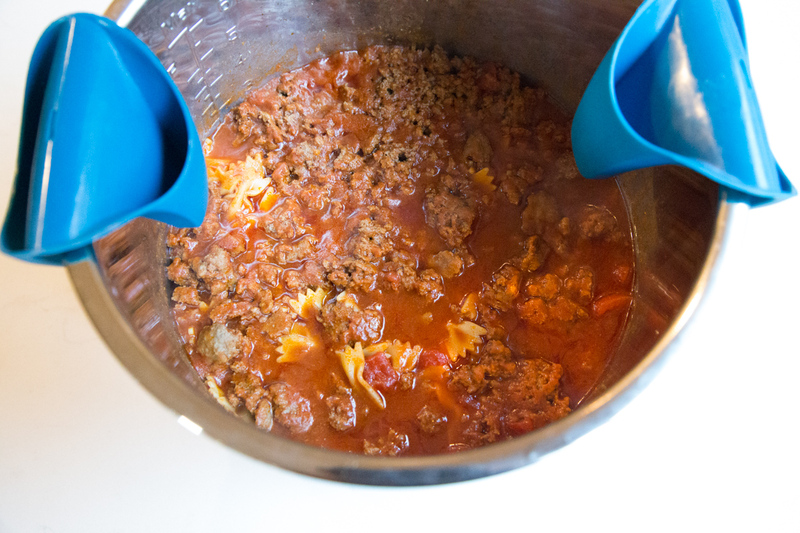 Inside is small shell pasta (bowties, in this case), tomato based sauce and ground beef. 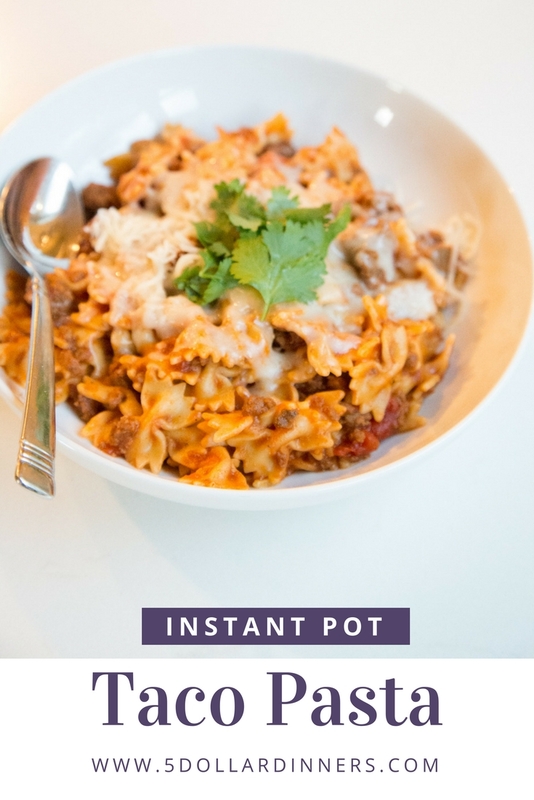 You can do this 2 ways with the Instant Pot. Brown the ground beef on saute mode. Pull pre-browned ground beef from the freezer. I went with option #2 since we still have LOTS of ground beef in the freezer! The Instant Pot just cooks pasta so perfectly, and it does a lovely job of infusing and melting flavors together! Brown the ground beef with the minced onion and garlic powder on Saute mode. (Or brown it in a skillet.) Drain, if needed. Pour the pasta over the browned ground beef in the insert. Then, pour the tomato sauce, diced tomatoes, taco seasoning and beef broth over the top. Gently stir to combine, and press the pasta so it’s all “underwater.” If needed, add 1/4 to 1/2 cup water so that the pasta is all underwater. Pressure cook on High, Manual mode for 6 minutes. Let naturally release for 10 minutes, then vent and release remaining pressure. Spoon into serving bowls and top with a few pinches of shredded cheese. 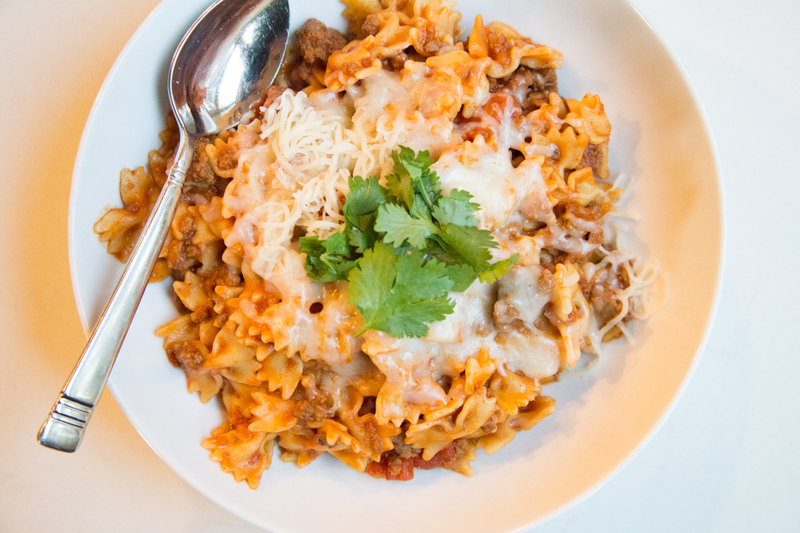 Serve Instant Pot Taco Pasta with side salad.